Ullal, April 1, 2015 : Briefing the media, Ullal Syyed Madani Darga, popularly known as Ajmer of South, is all set to celebrate the 20th Urs, a one in five years festival from April 2 to 26 at Tajul Ulama stage in Darga premises with religious and cultural extravaganza, said Darga Committee President U S Hamza. He said renovated Masjid will be inaugurated in the presence of Ullal Khazi Syed Fazal Koyamma Thanjal Al Bukhari. Later the inauguration ceremony of 25 day Urs and Tajul Ulama award conferring ceremony will be held at 7 pm. Along with religious leaders, Planning Commission Deputy Chairman C M Ibrahim, District-in-Charge Minister B Ramanath Rai, Health and Family Welfare Minister U T Khader will be the chief guests. On April 3, Karnataka Governor Vajubhai Rudabhai Vala will inaugurate the National Integration Conference. Elite meet, national student summit will be held on April 4, Dakshina Kannada District Jamat representatives’ meet (2 pm) on April 5 and Gujarat Haj Committee Chairman Sufi M K Chishty will speak at Sunni Ijtema programme (2 pm) on April 7. Sayyed Madani National Peace Conference and felicitations will be held on April 8. Ullal will witness various religious and cultural events every day in the presence of dignitaries. On April 24, the political and social conference will be inaugurated by Chief Minister Siddaramaiah. Planning Commission Deputy Chairman C M Ibrahim will release the documentary of the Darga. Sandul procession and Burda Majlis will be held on April 25. Darga Committee Vice President Ashraf Ahmed Right way, General Secretary U T Ilyas, Joint Secretary Mohammed Ashraf were present among others. 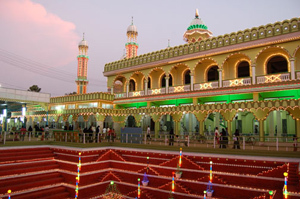 Ullal Darga is a place believed by Muslim fraternity to be of great power and in the past (1569) Sayyad Mohammad Shariful Madani, who arrived from Madina in Saudi Arabia to Ullal floating on the sea settled in the very place where the Darga stands now and performed miracles such as curing diseases. It has its doors open to people from all beliefs.